The updated book of Flower Drum Song, which premiered on Broadway in 2002, is a classic American story of immigrants who move to this country to make a better life for themselves and their families, and struggle with the conflict between retaining their cultural identity while still becoming part of America. Sometime in the 1950s, Mei-Li arrives in San Francisco's Chinatown after her father has died, at the opera house run by her father's best friend Wang. Wang proudly presents traditional Peking Opera despite the low attendance and his son Ta's attempts to turn the opera house into an Americanized nightclub to draw more crowds. Mei-Li gets a job performing and waitressing, befriends the brash dancer Linda, and falls in love with Ta. Talent agent Madame Liang arrives and helps them create a popular nightclub called "Club Chop Suey," where they "make something American with Chinese ingredients." Seeing the response of the crowd and the money the club is making, and unable to deny his love of performing, Wang abandons his traditional ways and joins in the show. Meanwhile, back in the central love story, Ta at first denies his feelings for Mei-Li, preferring someone more modern and American like Linda. But eventually he acknowledges his love for Mei-Li, his culture, and traditional Chinese opera. 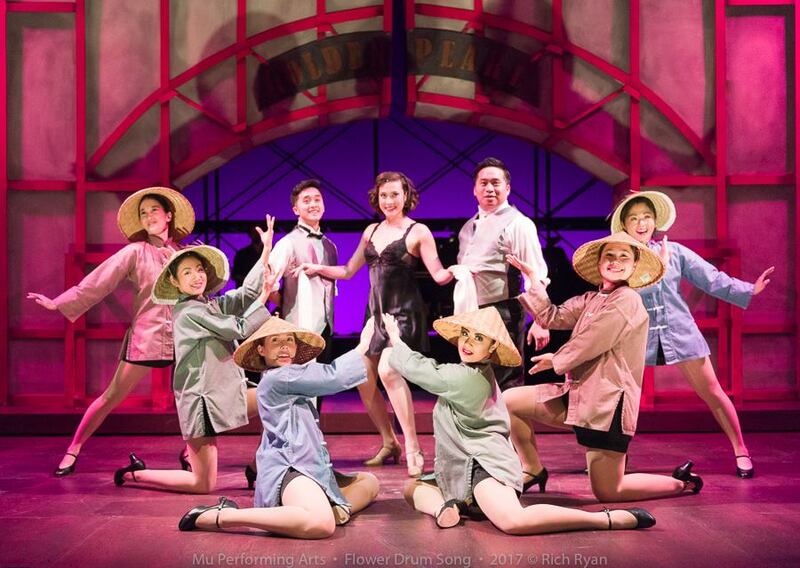 Mu first produced Flower Drum Song in 2009 at the old Ordway McKnight Theatre. 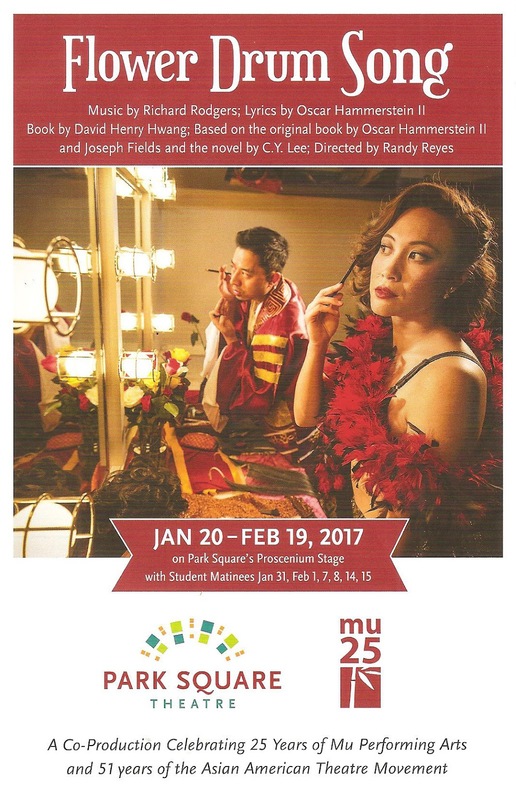 Mu's current Artistic Director Randy Reyes played Wang in that production, and now directs this production. 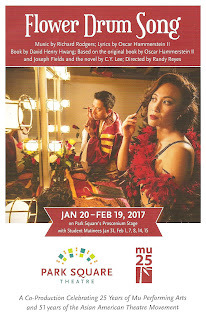 Sherwin Resurreccion played the son in that production and has now graduated to playing the father (although he's still too young for the role) and is quite charming in the role. The next generation fills in the younger roles, including a lovely Stephanie Bertumen as Mei-Li and the dreamy and talented Wesley Mouri as Ta. Other highlights in this strong ensemble include Eric "Pogi" Sumangil as the comic relief Uncle Chin, a fantastic Meghan Kriedler as the brash and bold Linda, the always great Katie Bradley as Madame Liang, and an adorable Daniel Sakamoto-Wengel as Harvard. The orchestration has been stripped down to a five-piece band, including piano, percussion, bass, woodwinds, and keyboard/string instruments, led by Andrew Fleser (band members are not listed in the program, for shame*). The score includes some really lovely songs in that classic and recognizable Rodgers and Hammerstein style, including "A Hundred Million Miracles," "You Are Beautiful," and "Love, Look Away," as well as some comic ones, like the charming duet "Don't Marry Me." But unfortunately David Henry Hwang was not given permission to change the lyrics, which still include some sexist lines like "MSG means more stunning girls" and "the girl who serves you all your food is another tasty dish." Even with the new book, Flower Drum Song is still not exactly a feminist piece, what with the dancing showgirls and marriage as a happy ending. In that way it's very much still a 1950s musical. But at least we have independent business woman Madame Liang, who became an agent when she was too old to play the screaming Asian girl in a war movie, and ambitious actor Linda, who refuses to settle or settle down in her pursuit of her dreams. When she sings "I Enjoy Being a Girl," it's clear it's just another role she plays to get what she wants. The design of the show is beautiful, a combination of '50s America and Chinese influences. Andrea M. Gross' costumes range from immigrant traveling clothes, to traditional Peking Opera robes, to gorgeous Chinese-inspired dresses, to '50s era dresses and suits. Penelope Freeh's choreography also spans both cultures, with lovely flowing traditional Chinese dances as well as raucous nightclub numbers. Mina Kinukawa's versatile scenic design is dominated by a large proscenium arch in two pieces which are moved and rotated to create different locations. One of my favorite moments of the show, that I remember from the 2009 production, is at the end of the show when each of the actors steps forward and states where they were born, ranging from Minneapolis to Los Angeles to the Philippines to South Korea. It's a really beautiful real life reminder that people from all over the world have come together to form this beautiful and diverse country we call America. Flower Drum Song was probably programmed into Park Square and Mu's season a year or more ago. There's no way they could have predicted how timely this story is at this moment, and how important it is to tell immigrant stories right now, the stories of all Americans. "To create something new, we must first love what is old." David Henry Hwang has done just that, and thereby rescued a beautiful classic score from a dated book that is stereotypical and offensive by today's standards (see also last year's newly rewritten Paint Your Wagon at the Ordway). It's such a smart idea, and allows us to continue to enjoy the classics while being more sensitive to the people whose stories are being told (I wish someone would do that with Miss Saigon, rewrite the book to be less offensive and more authentic storytelling, while retaining the beautiful music). 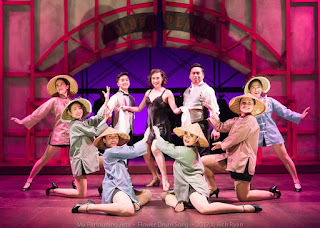 In a way Flower Drum Song is a perfect metaphor, and a perfect show for Mu's 25th season, showcasing the talented artists they've cultivated over the years, telling an Asian American immigrant story that is at the same time a thoroughly American story, using America's best art form - musical theater. Like Ta says about himself, this Flower Drum Song is 100% Chinese, 100% American, and 100% entertaining. 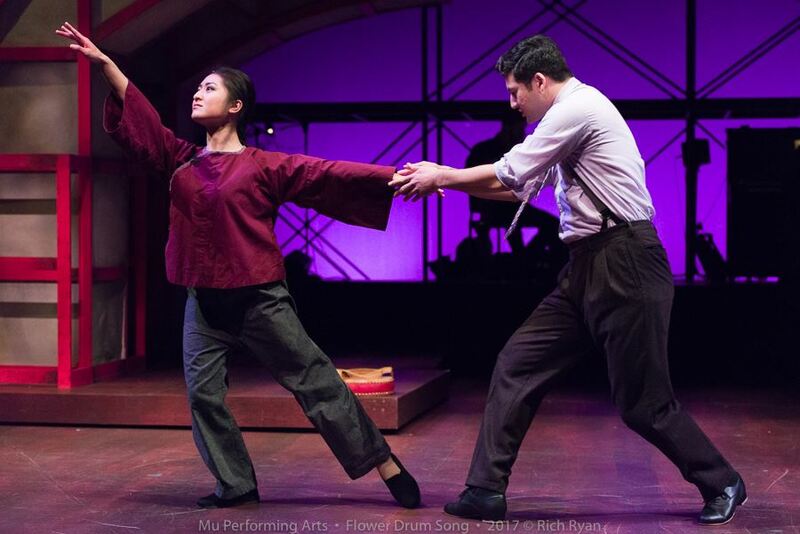 Flower Drum Song continues at Park Square Theatre through February 19, with student matinees available for groups (see Park Square's website for details). *I'm told there is an insert to the program that lists the musicians, but mine did not have one.